The taxi is available when the white taxi sign on the top of the car is lit up. Not available : When the taxi sign is not lit up. At a taxi stand, clients usually take the first cab on the top of the waiting line,but you have the full right to chose any other cab if you like to. Relating to a previous rule, some taxi drivers still refusing to charge more than 3 passengers. They are not allowed to do it since October 2001. The meter start at 2,20 euros. the minimum fare is 6,00 euros. the driver charges you for the journey he does to come to pick you up. You can't hail a cab in the street if less then 50 meters away, there are free cabs at a taxi rank. All taxis apply the same rates. No matter what the type of the car is. 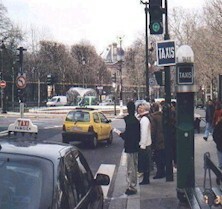 Taxis in Paris don't have one common color, unlike Berlin, New York, or Brussels.You'll find them in all colors and types. 2)Credit cards in equiped taxis (amount over 15 euros).